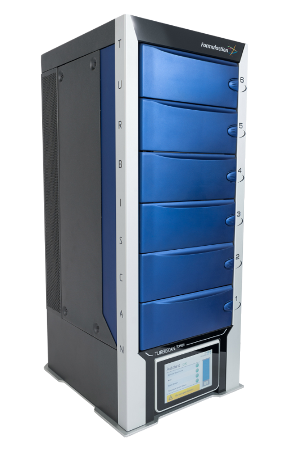 TURBISCAN TOWER is the brand new spearhead of the TURBISCAN RANGE to fully characterise the stability of concentrated dispersions (emulsions, suspensions, foams). Discover its new patented mechanical design, for an even better performance. Stability and shelf-life are key parameters in formulation studies. TURBISCAN is the first patented technology to analyse destabilization mechanisms in concentrated media. Creaming, sedimentation, agglomeration, aggregation and coalescence are detected at a very early stage without dilution nor stress. Stability kinetics and index are provided for an efficient sample analysis. With its six stations for simultaneous measurements, the TURBISCAN TOWER provides the most accurate and most versatile technique and setup for stability observations on the market. Higher vertical resolution: acquisitions every 20 microns.